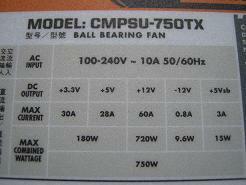 When it comes to PSU (Power Supply Unit) is more wattage better? The engineers at Corsair, the manufacturers of excellent RAM have sent TWL their TX 750W PSU to review. With Corsairs success with the VX450 and VX550W PSU and now the release of TX series, we couldn't wait to see what Corsair packed into TX750W. Corsair has released several TX power supply models at the time of this posting, all focused around high end gaming and ultimate performance. Let’s take a close look at what it has to offer. * Over Current/Voltage/Power Protection, Under Voltage Protection, and Short Circuit Protection provide maximum safety to your critical system components. * High quality Japanese capacitors provide uncompromised performance and reliability. * Extra long cables support full tower size chassis. The power supply was well packaged for shipment. It comes with a well documented instruction manual in multiple languages, zip ties, screws for mounting and is backed by a five year warranty. So for those of you who plan on using this PC for the long term, the 5 year warranty is something worth taking notice of.